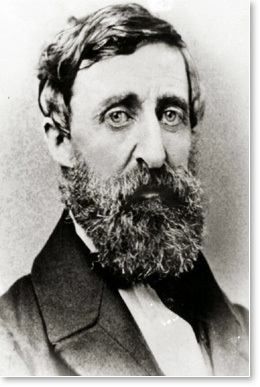 Henry David Thoreau was 28 years old when he went to Walden Pond, seeking spiritual regeneration through harmony with nature. 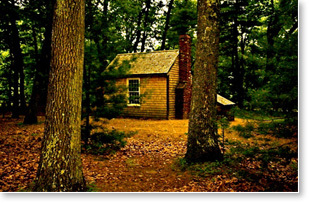 He lived there for two years and two months in a cabin he built himself, reading, writing, and studying the surrounding woodland life. He published his experiences and reflections in his book Walden. If with closed ears and eyes I consult consciousness for a moment, immediately are all walls and barriers dissipated, earth rolls from under me, and I float . . . in the midst of an unknown and infinite sea, or else heave and swell like a vast ocean of thought, without rock or headland, where are all riddles solved, all straight lines making there their two ends to meet, eternity and space gambolling familiarly through my depths. I am from the beginning, knowing no end, no aim. No sun illumines me, for I dissolve all lesser lights in my own intenser and steadier light. I am a restful kernel in the magazine of the universe. . . . The Cloud of Unknowing (Middle English: The Cloude of Unknowyng) is a spiritual guide on contemplative prayer and the esoteric techniques and meanings of late medieval monasticism. It is an anonymous work of Christian mysticism written in Middle English in the latter half of the 14th century. The style of language is very similar to the non-dual writings of Suzanne Foxton. The book counsels a young student not to seek God through knowledge but through what the author speaks of as a “naked intent” and a “blind love.” This is brought about by putting all thoughts except the love of God, under a “cloud of forgetting” and thereby piercing God’s cloud of unknowing, with a “dart of longing love” from the heart. This form of contemplation is not directed by the intellect, but involves spiritual union with God through the heart. “…may a man through grace have fullhead of knowing, and well he can think of them: but of God Himself can no man think. And therefore I would leave all that thing that I can think, and choose to my love that thing that I cannot think. For why; He may well be loved, but not thought. It is important to note that the monk is not advocating emotions over the intellect. Rather he is pointing beyond both thoughts and feelings to pure awareness. The purest form of love is simple attention. Attention is like a light that illuminates what we shine it on. So often we shine it on external objects, but if we turn attention on itself we find that we are that light, that pure awareness, that purest form of love itself. Our true nature is simple awareness. “Yea! and, if it be courteous and seemly to say, in this work it profiteth little or nought to think of the kindness or the worthiness of God, nor on our Lady, nor on the saints or angels in heaven, nor yet on the joys in heaven: that is to say, with a special beholding to them, as thou wouldest by that beholding feed and increase thy purpose. This means looking beyond the praiseworthy attributes of God to His attributelessness. It is looking beyond to effect to the source. It is looking beyond the fragrance to the rose. Looking beyond the Sun’s radiance to the Sun itself. Initially, we look outside ourselves for the Sun – this thing which illuminates and animates all of life. But in time we realize that we are the Sun looking out. The highest form of love then is when the Sun ceases to look outwards for itself, but rests in its own nature, having finally found itself. Update: Note how the monk does not throw the baby out with the bath water. He recognises the value of contemplating God’s fine attributes as well His attributelessness. The most important thing in life, according to the sages, is to know yourself as distinct from the objects around you. They declare that here lies all divinity, power, love, peace and the satisfaction of all desires. Knowledge of yourself as pure consciousness is absolutely paramount to all other knowledge. You are you – the silent, still, witness that is untouched by objects and adjectives. You are not what you own, you are not your body, you are not your emotions, you are not your thoughts, you are not the image reflected in the mirror. You are impossible to describe, but you can know yourself by being yourself. Getting to know yourself is another matter beyond the scope of this post. But one very important principle on the path of self-discovery is dis-identification. As silly as that may sound, most of us identify with inanimate objects and subconsciously make an identity out of them. Suffering is nothing more that attaching your identity to temporary objects – like thoughts, moods, health, clothes, money, status, culture. In a day-to-day sense it is valid to talk like this. But when you look at it really closely you will see that these definitions of yourself cause suffering by creating limitations and boundaries. The truth is you don’t walk – the body walks. You don’t talk – the mouth talks. You don’t think – thoughts arise on their own. You have no future or past – these belong to the body and personality. None of these things have any affect on you. If life was like a cinema, you are like the white screen which remains unaffected by the images, stories and dramas that play out on the screen. What you say has nothing to do with you – so there is no cause for pride in saying clever things or shame in saying stupid things. If life is going well, or not, this has nothing to do with you. You are eternally free from whatever situation is occurring before you. Your past and future are no reflection on you. You have committed no crimes or errors or meritorious deeds. You are not important or special or unimportant or insignificant. You are simply you. Death and sickness occur to the body and not you. You are the stainless, eternal self. This is not a theory or a belief, but must be clearly discerned. Freedom is the absolute knowledge/experience that you are distinct from everything. It is not a thought process, rather a direct realisation. It is also a secret, because the unspeakable cannot be spoken. Talk of your true nature is best kept out of daily affairs. However, if you do make an identity out of these objects and circumstances then you will suffer endlessly. You will be concerned about what others think of you and you will go to great lengths to appear intelligent, beautiful, pleasing, successful. You will fear sickness and death and you will pretend that you don’t fear them. You will worry about what you say, how you look and your social status. Your possessions will possess you. Your clothes will define you. Time will destroy everything you have. Nor the Pranas, or the five sheaths, or the five organs of action. no master or disciple, etc. I am indeed that eternal knowing and bliss, Shiva, love and pure consciousness. A friend recently trained in palliative care and had to do the following exercise. Make a list of five things that you love in your life and five things that you love about your body (ie the ability to walk, see, feed yourself.) Now, from each list choose one thing to give up. Notice some attachment there? Now imagine someone else choosing something from your list for you to give up. This exercise reveals attachments, doesn’t it? Andrew Cohen interviewed the highly respected Vedanta teacher Swami Dayananda. This conversation is very similar to Paul Brunton’s lengthy disputations that the enlightened philosopher has the advantage over the mystic. AC: In one of your books, you make a distinction between a mystic and a Vedantin. 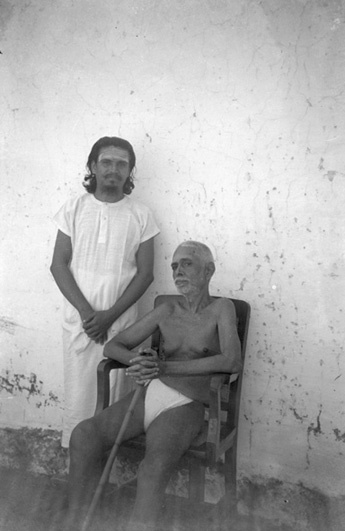 When referring, for example, to Ramana Maharshi as a mystic, you seem to be distinguishing him in some way from a Vedantin, and since many people consider him to be the quintessence of Vedanta, I’m curious to know what that distinction is. SD: The only difference here is that a mystic has no means of communication to make you a mystic, an equally great mystic as himself. AC: To clear up empirical confusion—is that what you mean? AC: In Ramana’s case, everybody said that he communicated through silence. SD: Again, this is an interpretation, because there are a lot of people I know who went to him and then came back saying that he didn’t know anything. AC: But there are also many people who said that they had profound experiences in his presence. SD: Each one has to interpret in his own way. But we can only say someone is a Vedantin as long as they teach Vedanta! Update: While it is true that many Vedantic swamis consider Sri Ramana to be uneducated, there is never any question about the incredible depth of his realisation. In this respect they hold him in very high regard. However, life is always balanced. It would seem that while Sri Ramana’s technical wisdom remained unexpressed, it was expressed by those around him – in particular by Ganapati Muni. This is the principle of disowned selves. I think it is fair to say that Ganapati Muni represented Sri Ramana’s opposite polarity. Sri Ramana was a monk, Ganapati had a wife and children. Sri Ramana stayed in one place, Ganapati travelled around. Sri Ramana focussed on the self-realisation, Ganapati considered community matters more important than personal realisation. Sri Ramana spoke little and maintained silence, Ganapati was a master of poetry and Sanskrit. In my mind, Sri Ramana expressed the masculine polarity and Ganapati the feminine. Ganapati’s work was passed on the his disciple K. Natesan who then passed it onto David Frawley. There are many kinds of energy healers with many different methods – each with stories of remarkable healings. There is no doubt in my mind that spiritual and energetic healing is an effective method of treatment for some people some of the time. Whether this kind of healing works for you depends on the kind of issue you have, the practitioner, the method, your ripeness for cure and many other factors. Many energy healers believe that the energy they work with is entirely benefic. I ask them where the energy comes from and they point vaguely at the sky and say it comes from the Divine or the Universe. This is a warning flag to me that the practitioner may be naïve. Not all energy used in healing is purely divine. Many practitioners do not know where the energy comes from, or whether it is trustworthy or not. Such a healer may honestly believe their gift is the highest God-given spirituality. They may talk about how they get their ego out of the way and let the Divine work through them, but they may be highly deluded – don’t believe them unquestioningly. One of the problems with immature healers is they treat sick people who have bad energy and then may not know how to manage that bad energy. They may pick it up, suffer for it themselves and pass it along to other people – all without knowing what has happened. Even highly experienced energy healers can have this problem. I know a woman who is a senior trainer for an international lightworkers school. A very wise yogi advised her to stop her practice because of the dangers involved. She refused so he taught her some techniques to at least mitigate the damage to herself and others. So how do you find a good healer? How do you know if the method is safe? To be honest, I don’t know any definitive method. It is the same with any person you meet. How do you know who you are getting involved with? Just keep your eyes open, listen to your intuition, look for clues and don’t expect the truth to be fully revealed upfront. Generally, I look for healers who are spiritually mature: you shall know them by their fruits. Also, I divide healers into two categories: 1) energy healers and 2) spiritual healers. To me energy healing is like classical physics. It’s all about transfer of energy which is why classical physics is sometimes called billiard ball physics. It is a very human level of healing, which is also the realm of duality and ego. Spiritual healing is more like quantum physics. It is a divine level of healing that acknowledges the primacy of consciousness. The method is usually prayer and surrender to the divine and is effortless. It is an impersonal method that goes beyond the concepts of “I” and “you.” Most healers will insist that this is where they operate from, but I suggest that it isn’t and you should make up your own mind. For some fascinating insights into this whole area of healing, take a look at The Notebooks of Paul Brunton. He has great wisdom and experience and discusses spiritual healing, energy healing, mental healing, The Infinite Way, Christian Science, New Thought, yoga and more. Brunton wrote A Search in Secret India and A Search in Secret Egypt. He met many great yogis and died in 1981. There is a lot I’d like to say about intuitives and psychics – I find the topic very interesting. There are many problems with these arts and it often amazes me how little people are aware of what they are getting involved with. I am certainly no expert but I have been around some very intuitive people and have seen some of the negative consequences. There are many different types of psychics and intuitives – including the aggressively mental, the over-sensitive astral types, the deeply inspired, the highly evolved, those who are mature with their gifts and those who aren’t. There are mind-readers who are insatiably curious to know what others think of them. This kind of paranoia is very unfortunate because eavesdroppers never hear good of themselves. There are those who get help from astral entities and other lower beings. Their talent often leaves them feeling drained and can result in sickness, nervous disorders, psychic attack and other troubles. There are those that have connections with angels and higher spiritual beings. This can be highly beneficial, but it can also come at a cost depending on the particular being and the type of relationship. Some beings require payment for their help (I’m told that the Oneness/Deeksha method falls into this category – the beings that help you also take some energy). Others may exploit the recipient’s ego-desire for fame or glamour, or make them oversensitive. There are different grades of angels and masters who are still evolving. There are people with sidhis – yogic powers – such as those with a highly developed heart chakra (anahata) who can tell the character of another. This is a very sattvic (wholesome) and mature ability and generally goes with a highly refined personality. There are those with ritam bhara prayga – the sidhi to know only truth – which is mentioned in Patanjali’s Yoga Sutras. This super insight is a powerful gift which seems to accompany a developed eyebrow (ajna) chakra, but again the rest of the personality may be relatively underdeveloped. So there are many types of intuition. The book Aghora II makes some good distinctions between the various types of beings that are around – and it gives a very clear warning: don’t mess with spirits. Sri Chinmoy says that even deities can be very helpful on your spiritual path, but may become a hindrance to you at the later stages. But the most important safe-guard is also the hardest: surrendering the ego. It is much easier to get sucked into bad situations when we are trying to get something for ourselves. As I mentioned in the previous post, the motivation for honest spiritual development is more important that the attainment of spiritual and mental abilities. A very similar topic is channelling and it is discussed at length at Jonathan Evatt’s website: Part 1 and Part 2. Dr David Frawley’s writes about channelling in his book “Ayurvedic Healing”. He says: we have to die a little to weaken the hold on our own life-force to let another being work through us. We tend to lose control of our emotional energy. It aggravates vata and can lead to arthritis, insomnia, epilepsy, paralysis and premature aging. He also says: “many mediums and channels are possessed by gods (lesser deities of the midastral world) and find the experience exhilarating.” They may provide knowledge and inspiration without harming the channel directly, but over time it aggravates vata. Then he says any form of possession is dangerous and weakens the connection with our own soul. You are currently browsing the SunYogi Blog blog archives for October, 2010.